With pest animals estimated to cost the Australian economy up to $1 billion a year, CSIRO scientists have developed a humane new technology that could help save Australian farmers’ crops and livelihoods. After successfully scaring away elephants from farms and crops in Africa, scientists are trialling the Vertebrate Pest Detect-and-Deter (VPDaD) technology in Australia against pests such as ducks, cockatoos, rabbits, wild dogs and more, starting in Queensland’s Lockyer Valley. “Ultimately we want to scale-up the technology and roll it out across Australia,” CSIRO scientist Dr Ash Tews said. The technology works by detecting and identifying animals as they come close to farms or crops, and emitting a tailored series of sounds and lights to humanely scare them away before they cause damage. In Australia, vertebrate pest animals can cause many thousands of dollars’ damage in a single dining experience, causing real problems for farmers’ orchards, vegetable and cereal crops, and potentially for livestock during critical periods of development or birthing events. In addition to the feasibility study underway in the Lockyer Valley, CSIRO is looking to partner with local agribusinesses to continue testing and trialling the technology in Australia, aiming to help primary industries facing problems with an array of animals including ducks, cockatoos, rabbits, feral pigs, wallabies, foxes and dingoes. The previous trial was conducted in Gabon, Africa, where elephants can present a significant problem for villagers and agricultural communities, capable of destroying a community’s entire season’s worth of crops overnight. In collaboration with agribusiness company Olam International, the VPDaD technology was successfully used to prevent elephants from destroying fruit crops. “One of the interesting issues with existing deterrent technologies is that, not only do animals become de-sensitised to them, but smarter ones can even learn to use the deterrents as an indication of a food source, which is the opposite of their purpose,” Dr Tews said. “Our autonomous technology allows the system to recognise animal behaviours in response to deterrents and modify the deterrent strategy until the desired effect is achieved. 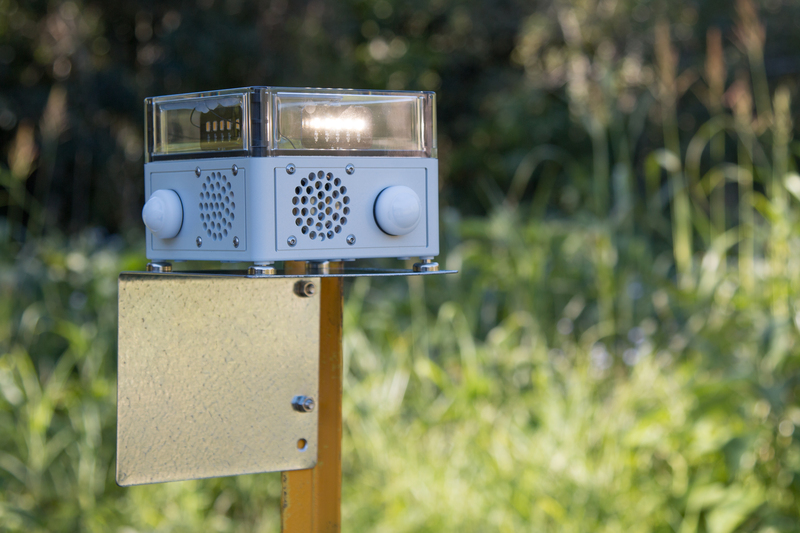 The VPDaD technology consists of two systems: a motion sensor device, and a collection of cameras that can pick up images and heat signatures of an animal, with lights and sounds which function as the deterrent for pests. CSIRO technology specifically developed for the camera program allows the computer to recognise and classify animals based on the images captured. In addition to looking at how animals respond to perceived threats, the scientists are also looking at longer-term aspects, such as analysing deterrent effectiveness and animal movements over seasons. A close up of one of the VPDaD nodes. 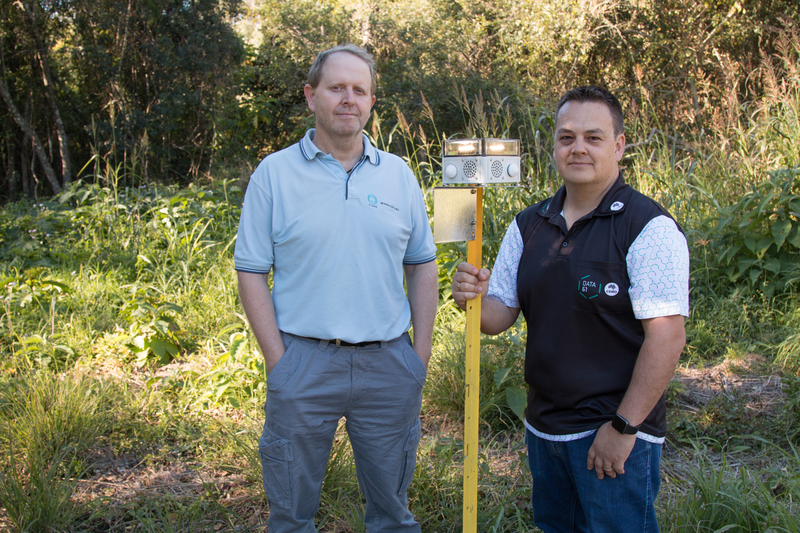 CSIRO researchers Dr Ash Tews and Dr Philip Valencia with the Vertebrate Pest Detect and Deter technology (VPDaD).